Let yourself be conquered by some of the most beautiful Italian islands: Sicily, Aeolian Ilsands and Sardinia. In 15 Days you’ll experience what those islands have to offer in terms of wealth of culture, wine & food treasure, archeological sites, breathtaking landscapes, great art cities, remains of all historical ages. 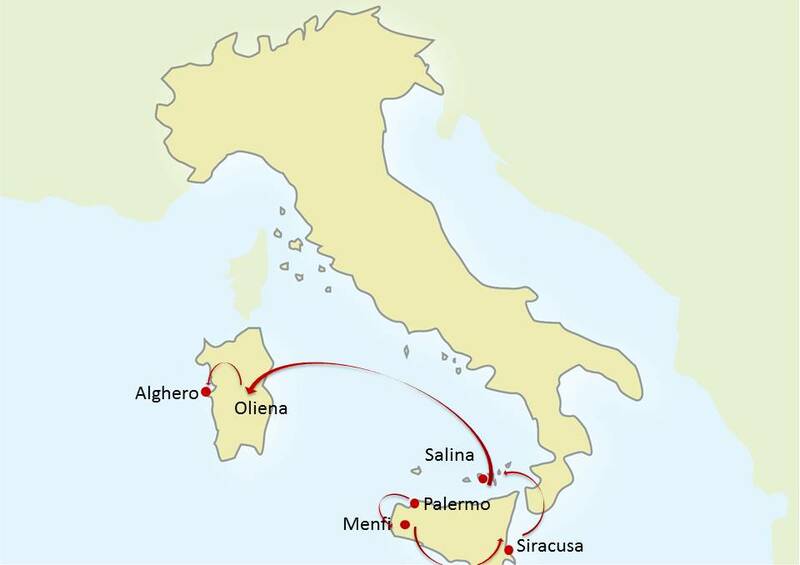 The Tour features Sicily, Palermo, Siracusa, Mt. Etna, Temples Valley, Marsala, Trapani, Aeolian Islands, Sardinia, Oliena, Alghero. Explore the best of Sicily with a tour of "Hidden Palermo", visit Monreale and its Duomo, go to Ortigia - the gorgeous and ancient seaside town of Siracusa. Let yourself be enchanted by Agrigento Valle Dei Templi, one of the richest archeological sites in the region, the Greek temples in Segesta and the breathtaking mosaics of the Roman Villa del Casale. Taste the Marsala wine, sampling typical Sicilian baked pastries and enjoy a Sicilian Cooking Class. Cruise around the Aeolian Islands, swim in Salina in the beautiful Bay of Pollara and in the blue waters of Venus Pool in Stromboli, visit the Cavallo Grotto and hike Stromboli Volcano. Discover Oliena, a Sardinian town that is off-the-beaten path but rich in history and tradition, have a tour of Neptune’s Cave and Nuraghe Palmavera. Walk through Alghero old town and sail in the nearby Sea National Park. 14 Nights accommodation in exclusive and fascinating 4 stars sup. / 5 stars Hotels with full buffet breakfasts: 2 nights in Palermo, 2 nights in Menfi, 3 nights in Siracusa, 3 nights in Salina, 2 nights in Oliena, 2 nights in Alghero. Private sightseeing Tours with expert local English speaking Guides in Palermo (Classic Palermo with its markets & Monreale) – Segesta archaeological site – Villa del Casale – Agrigento archaeological site – Siracusa (Archeological park included) – Alghero (Neptune’s Cave); including all the entrance fees to the sites visited avoiding waiting lines. Sicilian Food Tastings and entrance tickets to the main sites included. Winery visit in Marsala (tasting included). Typical Sicilian Cooking Class in Siracusa (grocery shopping in the local market & lunch included). Full Day private excursion (about 8 hours excursion) with van with English speaking driver-guide on Mt. Etna Volcano. Mt. Etna winery visit + lunch with wines pairings. Hydrofoil tickets Milazzo – Salina, Salina – Stromboli, and Stromboli – Milazzo. Full day private boat tour of Salina, Lipari and Vulcano islands. Private hiking excursion on Stromboli Volcano. Flight tickets Catania – Cagliari. Full day boat excursion with an old sailing fishing boat (lunch included). All private transfers by deluxe van with English speaking driver available for transfers and excursions for the entire Tour (including airport). The tour begins in Palermo and ends in Alghero. Afternoon at your own leisure to relax and start exploring this beautiful city. Full Day dedicated to Palermo: explore the real heart of this amazing city, including the colorful and picturesque open air food market of “la Vucciria” or “Ballarò”. Taste the delicious typical Sicilian finger food: arancini, pane con panelle, etc. Admire the Duomo in Monreale, where the Arab-Norman art and architecture reached the pinnacle of its glory. Start your private tour visiting Segesta, an archaeological site with one of the most beautiful Greek temples still existing. In Marsala you'll visit a local Winery with delicious tasting at the historical cellar, with typical Sicilian delicacies and wine. Along the way, stop in Caltagirone, renowned for its ceramics workshops. Reach Piazza Armerina to visit the mosaics of the Roman Villa of Casale, recognized a UNESCO Human Heritage site.Typical Sicilian Cooking Class in Siracusa (grocery shopping in the local market & lunch included). Afternoon excursion with a private guide visiting the beautiful town of Siracusa. Stroll amongst the streets of Ortigia, the ancient part of the town beautifully set on the sea. No visit to Sicily would be complete without taking in Mt.Etna, along with the vineyards and pistachio groves planted in the lush soil! You will cruise around the Aeolian Islands with the first stop on the island of Salina that features a quaint village and the chance to taste "Pane Cunzato", a locally stuffed bread with delicious native ingredients. A full day boating excursion offers swimming in Salina’s beautiful Bay of Pollara and a visit to the pastel-colored town on the island of Lipari. On Vulcano Island, there is the tiny port of Gelso where guests will dip into the blue waters of Venus’ Pool, the thermal springs and mud baths at Cavallo Grotto, and visit the (400 m) Fossa Crater. Spend a day hiking with a volcanological guide on Stromboli, a small island with three active volcanos nicknamed the "Lighthouse of The Mediterranean" since minor eruptions are often visible. Day dedicated to relax and discover the fascinating traditions of Sardinia: the historic center of Oliena is still well preserved and rich of many churches. A walk through the streets, made of cobblestones, is certainly recommended. The old houses of the village, although some, now, uninhabited, maintained their original structure. Private guided tour exploring Neptune’s Cave and the prehistoric stone dwellings at Nuraghe Palmavera. In the evening, we suggest to walk through Alghero old town and explore this former Aragonese and Catalan fishing port. On the final day enjoy a tour of the island’s coastline on a vintage 1939 fishing boat, with a stop for snorkeling at a national park.